If you started your tour of the Ringstraße at the plain and elegant Postsparkasse by Otto Wagner, you should be ready to take a strong contrast: One of Vienna′s ugliest, most pretentious and most ridiculous buildings, the former "Imperial and Royal Ministry of War". Built on the peak of European imperialism and nationalist arrogance, the building reflects the spirit in which the Ringstraße was revamped in the late 19th century - and in which Austria, if not all of Europe, was driven into World War I. The architect to blame is Ludwig Bauman (his surname meaning "builder"), the construction took four years from 1909 to 1913. Therefore, this part of the Ringstraße was the last to be finished alongside with the Hofburg Palace, just a year before the outbreak of the war. The Kriegsministerium or Ministry of War was previously located in the centre of the first district, at the Am Hof Square - you will be able to spot the building by a memorial plate or by the Starbuck′s around the corner. It stands on the site of an old Babenberg court, the dynasty that ruled over Austria before the Habsburgs. Back to the new Ministry of War: After its opening, a radio transmission station was built on top of its roof. When this transmission station was extended and modernised in 1923, broadcasting started in Austria. The building was used for the administration and co-ordination of army and navy. Given that World War I transformed Austria from an Empire spanning over half of Europe into the dwarfed nation it still is, I assume the officials of the Kriegsministerium didn′t do an awfully good job. In fact, internal power struggles and bureaucratic madness ruled over the ministry even before the construction of the current piece of ugliness: In 1901, a competition among military engineers tried to find an appropriate plan for the new building; it took six years until in December 1907 a public competition was held to finally find a proper design. 166 architects registered for the competition, but only 66 final blue prints were submitted at the deadline in April 1908. The famous architect Adolf Loos submitted a project quite remarkably named "Homo". Why he chose this title for the design of the military headquarter, I do not know. It was rejected, though, apparently because "Homo" did not include a quote for the costs. Otto Wagner, probably even more famous than Adolf Loos, submitted his project "Pallas", which was rejected apparently because he had failed to meet the formal rules of the competition. Military men like rules. Leopold Bauer submitted a project with no fancy name, but one giant of a tower in the centre that was meant to quote a medieval fortress. The military officials loved the phallic design, the blueprints were purchased, but the project never executed. Officially because of the high costs due to the enormous tower. Max Ferstel submitted a project called "Eugenio von Savoy", referring to Austria′s victorious and glorious general Prince Eugene. The project with the fancy name was characterised by fancy facades - but nobody liked the playful design and so Ferstel was rejected. Finally, Ludwig Baumann′s project "Maria Theresia" - referring to Austria′s "Mother of the Nation" Empress Maria Theresia - was purchased and confirmed. The design is a super-sized version of Baroque style with overblown ornaments. 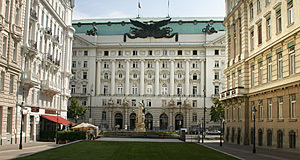 However, the successor to the throne, Archduke Franz Ferdinand, found the design too humble and ordered bigger and better gates and a double-headed eagle on top of the building that was so enormously big that another floor had to be added to the design in order to support the metal bird. Franz Ferdinand′s taste in architecture was legendarily poor, being a good heir to Emperor Franz Joseph I. Austria was spared of more such architectural jokes thanks to young Mr Princip, a Serbian student who shot Franz Ferdinand in 1914 in Sarajevo, on the Serbian National Holiday. Thereby, he triggered World War I and the end of the "K.K. Kriegsministerium". After the war, the building was used by the - now Republican - army and after the Anschluss by the Wehrmacht. During World War II, a bomb hit the Kriegsministerium, which did not cause much damage, though. But only a bit later, the Battle of Vienna finally did a lot of harm to the building and it wasn′t until 1952 that it could be used again. Since then, it is an administrative building shared by several ministries dealing with economy, finance, infrastructure and development. The Kriegsministerium is therefore not open to the public, but you can admire the giant eagle and other amazingly ugly ornaments from the Ringstraße.